Most of the slot machines are set on 90-100% payout range, but what does it actually mean? In short, if the machine is set on 97% payout, the players will get 97 for every 100$ back. The casino will keep the rest. You have to keep in mind that this percentage stands for a very long period of time. Random number generator runs the machine and randomly chooses numbers, or symbols, to be shown on every reel. Slot is a game based on luck. If you are lucky, you will win, it is quite simple. 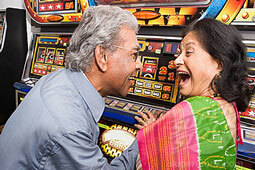 Most of casinos offer high payout ratio, to keep their customers. It is important to give a little and keep a little. This way everybody is happy. So, we have for example, three reels. On each reel there are, say, 22 places. There is also a certain number of different symbols and numbers. Some of those symbols are worth much more than the others, and they are set up to show only once, while the others can be shown more times, according to their value. If we have 128 different number and symbols, our chances for getting the highest payout symbol are 1:128. Also, if it is set up for 8 to be shown 9 times, the chances for getting 8 are 9:128. When you multiply these odds with the number of reels, you get the total figure for the final odds for getting the jackpot. If you calculate the odds for getting the combination with eights, the odds are significantly better, and the payout will be accordingly lower. Can We Predict the 'Jackpot Time'? No, we cannot predict the time when we can hit the jackpot. It is absolutely random. On the same machine it is theoretically possible to hit three jackpots at the same day, or none for weeks. There are no 'hot' and 'cold' machines, and our odds are always the same. Doesn't matter if we just hit the jackpot, the chances for the next one are the same. Although lots of players believe they have much higher chances for winning if the particular slot didn't have high payout for a long time, it simply isn't so. We have to remember that the average payouts are calculated for long periods, maybe one year or so, and cannot be applied on few hours session.